Part of a remastered trio that also includes live set Stand In the Fire and commercial peak Excitable Boy, The Envoyhas – perhaps inevitably given that it has never previously appeared on CD – been an oft-neglected item in the WZ catalogue. In fact, it’s pretty much grade-A Zevon throughout, from the bracing rock-blast of the opening title track – whose portrait of shuttle diplomacy amid chaos in the Middle East could hardly be more resonant right now – to the churning downfall-of-a-dealer chronicle, ‘Charlie’s Medicine’. 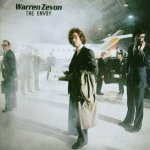 A commercial non-starter in ‘82, The Envoy should now be regarded as one of Zevon’s strongest collections.